We believe that practices and theories of improvisation have much to teach us about pedagogy. Individuals with a wealth of experience in education founded Happy Valley Improv. We all have research interests in the relationship between improvisation and education. 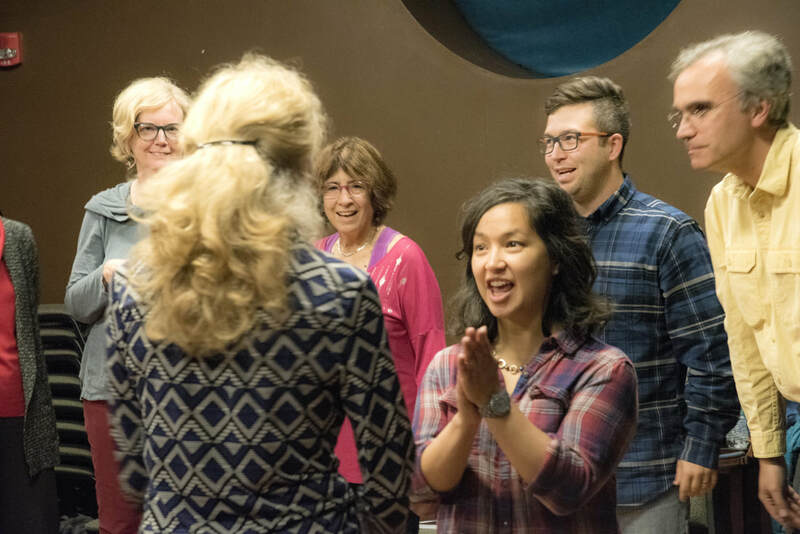 In addition, Happy Valley Improv offers unique workshops that explore what improvisation might have to teach us about the work of teaching and learning. People often say that teaching is improvisational. We believe that people can refine and develop their ability to improvise well, and doing so transforms our participation in learning environments. Simply put, the exploration of improvisation helps us to imagine how we might transform our ability to teach and to learn. These perspectives, combined with over 30 years of cumulative improv experience, make Happy Valley Improv uniquely qualified to work in educational contexts. Research is just beginning into the connections between improv and pedagogy. As individuals and as a company, we are dedicated to contributing to this knowledge base through practice, reflection, and writing. Happy Valley Improv ran a workshop for Penn State faculty in the Fall of 2017. Read more about that experience here: "Faculty members say 'yes, and...' to learning improv theatre"
Ballon BC, Silver I, Fidler D. (2007). Headspace theater: An innovative method for experiential learning of psychiatric symptomatology using modified role-playing and improvisational theater techniques. Acad Psychiatry, 31, 380–7. Boldt, G., Lewis, C., & Leander, K. M. (2015). Moving, Feeling, Desiring, Teaching. Research in the Teaching of English, 49(4), 430. Esposito, L. (2016). Saying “yes, and” to collaborative prewriting: How improvisational theater ignites creativity and discovery in student writing. English Journal, 105(5), 42-47. Hackbert, Peter H. (2010). Using improvisational exercises in general education to advance creativity, inventiveness and innovation. US-China Education Review. v7 n 10, pp. 10-21. Maples, J. (2007). English class at the improv: Using improvisation to teach middle school students confidence, community, and content. The Clearing House: A Journal of Educational Strategies, Issues and Ideas, 80(6), 273-277. Sawyer, R. K. (2011). (Ed.). Structure and improvisation in creative teaching. Cambridge, MA: Cambridge University Press. Stewart, L. S. (2015). A catalyst for change: Staging dramatics for preservice English teachers through improv, role-play, and collaborative reflection. English Education, 47(2), 168-187. Tanner, S. (2018). Whiteness, pedagogy, and youth in America: Critical whiteness studies in the classroom. New York, NY: Routledge. Tanner, S., Miller, E., & Montgomery, S. (In press). We might play different parts: Theatrical improvisation and anti-racist pedagogy. Research in Drama Education. Tanner, S. (2017). Teaching to the golem: A pedagogical intra-action. Journal of Literacy Research, 49(3): 321-341. Bermant G. (2013). Working with(out) a net: Improvisational theater and enhanced well-being. Front Psychology, 4, 929–3. Heble, A. & Caines, R. (2015). The improvisation studies reader. New York: Routledge. Krueger, K. R., Murphy, J. W., & Bink, A. B. (2017). Thera-prov: a pilot study of improv used to treat anxiety and depression. Journal of Mental Health, 1-6. Krusen NE. (2012). Improvisation as an adaptive strategy for occupational therapy practice. Occup Ther Health Care, 26, 64–73. Nachmanovich, S. (1991). Free play: Improvisation in life and art. New York: G. P. Putnam’s Sons. Pfeffer M. (2012). Improvisation for anxiety – It’s hard to be terrified when you’re laughing. OCD Newslett, 26, 14–16. Scott CL, Harris RJ, Rothe AR. (2001). Embodied cognition through improvisation improves memory for a dramatic monologue. Discourse Process, 31, 293–305. Phillips Sheesley, A., Pfeffer, M., & Barish, B. (2016). Comedic improv therapy for the treatment of social anxiety disorder. Journal of Creativity in Mental Health, 11 (2), 157-169. If you're interested in our work in improvisation and pedagogy, please fill out the form below! We will review your submission and get in contact with you. You can also email us at happyvalleyimprov@gmail.com or call us at (814) 954-0053.